As wonderful as being in town is, it is even better to get back out on the trail. I think I have said this before; I don't sleep well in town. I go to sleep late and wake up early. Really early, like three or four in the morning. Last night I went to bed after 11:00, and I was awake a few minutes after 4:00. I had to wait until a decent hour to get up and shower and pack up all my gear, for fear of waking people in the other rooms. I settled up with the proprietress around 8:00 or so, but then hung out with some ofthe other hikers out back for a while. Finally I heftede my ridiculously heavy pack, groaned, and dropped it back to the ground. Goodness! I went completely overboard at the grocery store yesterday. I could barely cram my food bag into my pack. I took the pack off and put it on the bathroom scale that is in the hiker hosxtel. 43 pounds! That's 4 pounds more than it weighed on the day I started, and I've gotten rid of a few things since then. That weight is all food! I am going to have to have a big feed tonight and get the reduced as fast as I can. I hiked out of Damascus, after stopping on the way for a big breakfast (food. I am obsessed with food) , along the Virginia Creeper Trail. The Creeper Trail is a rails-to-trails conversion so follows lovely, gentle grades. Unfortunately, the AT soon veers off and climbs up into the hills for a few miles, the descends back down and just to tease a poor, tired, overburdened hiker, parallels the Creeper trail at a very short distance oif only 30 or 40 feet, for a long ways. The Creeper Trail is clearly seen in its flat, even, easy gradedness, while the AT climbs up and down every stupid little bump in the terrain and hops over rocks and whatever else. So frustrating! I set off today with no particular goal in mind. I decided I would hike to the first shelter out of town, then decide if I wanted to go on to the next or not. Well, I got here all hot and sweaty, and was greeted with a lovely setting with a small grove of evergreens out behind the shelter casting some wonderfully cool shade. After walking down to the stream to get water and to wash up a bit, I strung my hammock up in the shade and lay down on top of it to read my book and sway in the cool breeze. Soon enough I fell asleep and awoke only when another hiker walked by on her way back from getting water. It's a good thing I woke up or I might have slept right until bed time! Well, that hiker and a couple of others were here just to get water and have moved on, but I've decided to definitely indulge myself and am staying here for the night. Tomorrow is soon enough for ambition, when I will push the 18+ miles to Thomas Knob and the Grayson Highlands. I asm excited that the weather should be good when I am up there; so unlike mhy experience so far with the high parts of the trail. I am looking forward to seeing the ponies at Grayson Highlands State Park. Another hiker, Midget Momma (she's short and says she has a son who is 6'4") just showed up, so I guess I wonm't have the place all to myself tonight. And I know there are a bunch of hikers who planned to leave town late this afternoon and hike, so I imagine there will be more coming later. I look forward to town stops so much, but they are exhausting! I am always surprised how tired I am when I leave town. This evening looks to be a lovely one, and I am sure I will have a restful night tonight and be ready to do some real hiking tomorrow. A great day. Plenty of miles. Plenty of heat. Plenty of tired. But a great day. Up. Down. Up again. Climbed Mount Rogers, the highest peak in Virginia. Camped with a bunch of other hikers at a place tucked into the trees and out of the wind that is roaring just yards away out on the bald. I hauled a HUGE food bag out of Damascus. It makes my pack weigh a ton. It weighed more yesterday morning leaving Damascus than it did when I started at Springer Mountain. But I think it's worth it. I am eating like crazy and it sems to help. I also bought a small container to carry olive oil while in Damascus, and I add it to every evening meal. I've also started taking daily vitamins. I am considering maybe getting some protein powder somewhere and using that every day as well. I am trying to avoid wasting away to nothing. It's getting late and dark so I am going to quit for tonight. Goodnight all! I passed the 500 mile mark today. There's a part of me that didn't really believe I'd be able to do it, but I did! 500 miles really feels like something. I've endured fellow hikerss telling me all about the horses and the exotic cattle with the wide horns they saw in the Roan Highlands, while I hiked through there in the wwind and rain and saw nothing. Last night when I arrived at Thomas Knob the people I was camping with were telling me stories of their encounters with the ponies, while I never saw any of them. Well, last night I could hear the ponies calling and neighing to each other all night, and this morning as soon as I started walking I ran into group after group of them. They're really cool. I took a bunch of photos which I hope you'll all like whenever I can get them posted. I planned to walk 16 miles today, stopping at Hurricane Mtn Shelter. When I got there it was kind of early and I decided to cointinue on 4 more miles to Comers Creek where I could get water and hopefully camp. When I got there the creek was in a ravine and there was no place to camp so I pushed on another 2.7 miles to where I could camp. Whew! I was beat. I ate my dinner and crawled into bed. There was a bunch of other hikers there, all in therir early to mid-twenties. While I was lying exhausted in my hammock they were all sitting around the campfire talking about how easy it is to knock off 20 mile days and still have energy left at the end of the day! I guess the number of decades you've been arfound really does matter. I was awake early this morning and rather than cook breakfast where I was camped I packed up my gear and hiked about 2 1/2 miles to Trimpi Shelter, where I got water and cooked my breakfast. I had a leisurely breakfast and then walked on. The weather this morning was warm and more humid than it has been the last couple of days. The forecast called for afternoon thunder showers and I was happy that I had only about 13 1/2 miles to hike to reach Partnership Shelter; hopefully before the storms hit. Soon after leaving Trimpi Shelter I ran into Sir Richard taking a break on the trail. We walked together and chatted about this and that the rest of the way to Partnership Shelter, arriving there about 12:30 (or, as Richard would say, half noon). Partnership Shelter is not the usual trail shelter. It is located directly behind the Visitor Center for the Mount Rogers National Recreation Area. The plumbing for the visitor center has been extended to the shelter, and the shelter features both a shower and a water tap. There is also a phone outside the visitor center from which one can call and have pizza delivered. All this being so, as soon as we arrived Sir Richard and I walked overe to the visitor center and ordered two large pizzas and a 2-liter bottle of soda. We hung around waiting for the pizza to arrive, meanwhile watching the thunder clouds build in the sky. Our pizza arrived and we made it back to the shelter with our lunch just before the lightning started to strike, the thunder boomed, and the skies opened up with torrential rain. Onjce I polished off my pizza I took a shower and rinsed out my very salty, sweaty T-shirt and socks. It had been my plan to camp there at the shelter, but the area was posted "No Camping" and I don't carry a pad so can't sleep on the hard shelter fllors. That being the case, I hung around the shelter for the afternoon, cooked and ate my dinner, then hiked on aboiut a mile and a third and found a spot down on the lee side of the ridge to hang my hammock. I climbed in and spent a comfortable evening listening to my little radio and reading my book. It rained pretty hard last night. 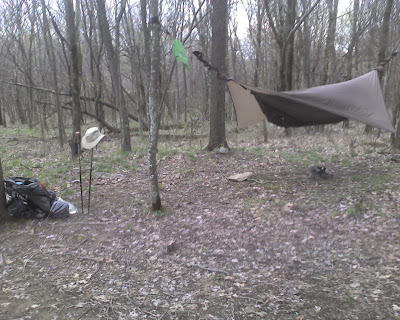 I had hung my hammock on the side of the hill and the head end tree was upslope of the foot end tree. It is hard to get a level hang when the trees are not level with one another. I hung the foot end as high up the tree as I could reach, but when I hung the head end so that the hammock was level, it sagged enough with me in it that I touched a downed log under my back. Because of this I had to hang the hammock with the head end a bit higher than the foot end. It is comfortable enough this way, but it meant that I was lying at the fooot end of the hammock, and therefore my feet and the foot of my sleeping bag were up at the peak at that end of the hammock, putting my feet up against the screening and thus exposed to some of the blown in rain. Not a big deal, but the foot of my sleeping bag is a bit damp. When I got up it looked like it was going to rain some more, but as I walked into the morning the clouds broke up and it proved to be a lovely morning. I am down at a much lower altitude now, and spring is bursting out everywhere. I walked through meadows and over low hills. There is a sweetness in the air this morning and I am not sure where the sweet smell is coming from. I passed a lilac bush or two starting to bloom, and some flowering dogwoods, but not enough to explain the sweet smell. Maybe there is some kind of meadow grass that is so sweet? In any case, it was almost sickeningly sweet. I walked through all that green growing stuff just imagining all the photosynthesis taking place and pumping oxygen into the air for me to breather. Ahh! I could soon hear the tgraffic on I-81, and then descended into Rural Retreat (part of Atkins, VA). There is an exit from I-81 here, and a motel, a restaurant, and a couple of gas stations. I took a room at the motel -- the Relax Inn -- and picked up the food drop that Jodi mailed here for me. I just got back from lunch at the restaurant up the road. Serviceable but unexceptional food. Once I finish this email I will go through what food I have left in my food bag and all the great stuff Jodi sent me, and get myself organized for the next section to Bland, VA.
You might remember me writing about my frustration with getting access to my home network from public computers. Well, I have hopefully solved that problem. Yesterday I ordered a new netbook from AMazon.com and am having it sent to me in Pearisburg. I will keep this in my bounce box and mail it up the trail to each of my town stops. I'll be able to set it up the way I want it, and will be able to connect to my home network from any WIFi hot spot. And once I get initial internet access via WiFi I will be able to download the software I need to be able to use my cell phone as a modem for the computer, once Jodi sends me the sync cable for my phone. As I said, hopefully this will alleviate my computer frustrations. It is clouding up again now, and there is supposed to be more rain tonight. If it's got to rain, I'd just as soon have it happen while I am indoors! Atkins, VA to "Spring Fed Pond"
Hey, I am half way to half way! I have now hiked more than 1/4 of the miles from Springer Mtn to Katahdin. After a big breakfast at the restaurant this morning -- two eggs, two pancakes, two sausage, two bacon, two biscuits with gravy, home fries, coffee, orange juice, and water -- I set off a few minutes before 8:00. After crossing under the highway the trail spends several miles traversing farm fields and overgrown meadows. It was really nice. At this low elevation everything is in bloom and the trees and shrubs were full of birdsong. 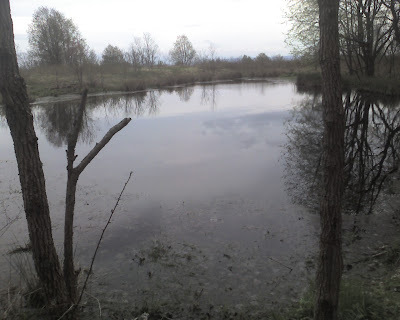 I climbed up onto a ridge and again was high enough that spring hadn't quite arrived, but then descended back into the lowlands and for another few miles the trail threads through farm country. I must have climbed a dozen stiles over farm fences. At each one I thought to myself that this is the perfect opportunity to fall, break a leg, and bring my hike to an end. Luckily, that didn't happen. I was feeling good today after all that food and a good rest, and I reached my intended destination, Knot Maul Shelter, 14 miles into the day at 1:30. I ate lunch there and contemplated the sky, which had treated me to rain showers on and off all morning. One minute it would look dark and menacing, and the next bits of blue sky would appear. Finally I decided it was simply too early to call it a day and around 2:00 I saddled up and moved on. I hiked a couple more hours until I came to a Forest Service road. Checking my book I could see that I should come to what is listed as "spring fed pond" in about 2 miles of uphill hiking. I decided that was my destination. Well, the uphill was of the heart attack inducing kind. At least, it felt that way at the end of a long day. It took about 20 minutes longer than I thought it could possibly take, but I finally arrived here and found a nice spot in the woods just behind the pond to hang my hammock and call home for the night. The sky has looked like rain is imminent ever since I arrived here, but I've got camp set up, cooked, ate, and cleaned up from my dinner, and once I finish this I will crawl into my hammock and listen to my radio or read my book until sleep overtakes me, which won't take long. It looks like I will be in Bland sometime Sunday morning. Unless the weather is a total washout, I plan to get into town to resupply then get back out and move on to the next shelter. So, a miserable day. It had to happen sooner or later, I guess. There is no special reason why this day should have been such a negative experience, but it was. The sky stayed dry until after I went to bed last night. I woke up around 11:00 or so to the sound of rain, but rain at night while I am tucked snug in my hammock is no big deal. What is a big deal is the dense fog that rolled in after the rain stopped. Boy, how I hate that fog. I blows through my hammock and gets everything wet. It condenses inside the undercover, which then gets the bottom insulation wet. It condenses on my sleeping baga, making that wet. It condenseson the netting on my hammock, and it condenses on the underside of the tarp. Since the hammock gets rolled up inside the tarp for packing, that just makes the hammock even more wet. So I woke up in a foul mood. It was raining when I got up, so instead of making breakfast I packed up and planned to hike the two miles to Chestnut Knob Shelter then cook breakfast there. I hiked through the dense fog until I got to Chestnut Knob. As I approached a hiker was just returning to the shelter, I presume from fetching water. I said "Good morning" and he looked at me, said nothing, then walked into the shelter and closed the door. I don't know what that was about, but it seemed like something my day would be better without, so instead of stopping I continued on down the trail. It was foggy and the rain continued on and off all morning, so I stopped briefly to eat a couple of Pop-Tarts, a candy bar, and some gorp, and pushed on until I reached Jenkins Shelter, at about 12 miles, around 12:30. I was feeling beat so boiled enough water for a couple of cups of tea, and to make the instant oatmeal I should have eaten this morning. Once I consumed that, I started in on lunch. I spent a good hour and a half eating and sipping tea, and was starting to feel a little bit more optimistic. I toyed with the idea of pushing the next 12 miles to Rt. 52 and hitching into Bland so I could spend the night at the motel, but two things stopped me. First, there was no way I had 24 miles in my legs today. Second, I know this would disappoint Ken and I couldn't stand to lower myself in his esteem. So I stuyck with my original plan and hiked on another 5 miles or so to this spot at Laurel Creek where I am camped. It's a nice spot, except that it is right next to a road. I can't be seen from the road, but I hear cars go by every half hour or so. That makes me a bit nervous. I have a (not so) hard and fast rule never to camp next to a road, but accordning to my book there isn't another place to get water or to camp between here and Bland. What's a boy to do? So I set up my hammock back behind a thicket of rhododendron. Like last night, I am fortunate that the rain has held off while I set up camp, washed my hair and took a bandanna bath, cooked and ate dinner, and now while I sit and write this. Soon I will pack everything up and climb into my hammock with my radio and my book. Maybe I will be fortunate like last night, and there will be something interesting to listen to. Last night I listened to some great jazz on an NPR station. But tonight I am down in a hole so I might not be so lucky. There is no phone reception here so this isn't going to get sent until tomorrow at least. Oh, at one point this morning I was hiking up and down every stupid bump on Chestnut Ridge, and I passed a sign that said "VIEW." In my foul mood I said "@#$%^ VIEW" rather loudly, then a moment later four local day hikers rounded the corner in front of me. If they had heard me, they were nice enough not to let on. We chatted for a few minutes, and that did more than anything else today to help me cope with my bad mood. Here's hoping tomorrow morning is dry. I have seven miles to hike to the road, then I'll hitch into Bland to shop and the grocery store, and hopefully to get lunch at the Subway in town. After I hitch back to the trail it is only three miles further on to the next shelter. That's my goal for tomorrow. Then on Wednesday I should get to Pearisburg where I have a bunch of maikl waiting. I plan to take a zero day there. I went to bed last night and searched for something to listen to on the radio. I was camped way down in a low gap, and I could get only two FM stations, nothing on AM, and some Spanish language stuff on the shortwave bands. So my choices were either Christian evangelization, or NASCAR. I chose NASCAR and listened to the something-or-other 400 for a couple of hours. I woke up this morning at 6:30 to the sound of a steady rain on the tarp. I decided to try to wait it out and snoozed on and off until 8:00AM. It was still raining, but not as heavily. I got up, packed my gear, ate a Pop-Tart, and set off to hike the 7 miles to Rt 52. I felt so much better than yesterday! The 7 miles flew by in less than 2 1/2 hours. When I reached the road I wasn't sure exactly which road was 52 and I wasted a bit of time walking up this road and down that one, but I finally saw a woman getting out of her car in front of a small church and she confirmed wqhich road would take me to Bland, where I needed to go to buy food and stove fuel for the next three days. It is 2 1/2 miles down the mountain into town. I walked about a half mile or so before I managed to get a ride the rest of the way. My driver pointed out where the grocery store was, then dropped me off at the Subway as I requested. Yummy! That was good. I left the Subway and walked back into the center of town where the grocery store is, and did my shopping. My guidebook says that Bruce's Market sells stove fuel by the ounce, but when I asked the clerk had no idea what I was talking about. Uh oh. So now I had food for the next three days, but no way to cook it. I was down to about 1/2 ounce of stove alcohol, so I couldn't leave town until I found some fuel somewhere. There is a NAPA Auto Parts store across the street from the market, but they were closed on Sunday. Then I tried the Citgo station around the corner and they had Heet gas-line antifreeze, which is nothing more then methyl alcohol and makes great stove fuel. Saved! I made one last stop at the bank to get some cash at the ATM so I won't have to worry about that chore when I get to Pearisburg, then I headed out of town and back up towards the trail. For whatever reason, I couldn't get a ride on the way back and had to walk the entire 2 1/2 uphill miles back to the trail. Why wouldn't somebody want a smelly wet hiker and all his smelly wet gear in their car? Right, I don't know either. So I got out of town and hiked a few miles into the woods to this shelter. This makes a rather short day but looking at the book there is no place with water for the next ten miles, and I got here too late to try to add another ten miles onto my day. That being the case, I will hang my hammock out behind the shelter tonight. It is nice to be camped at a shelter so I can get in out of the rain to write this enail, and to cook dinner and do other chores. I am thinking about buying a bigger tarp for my hammock, so that it will no only keep my dry when I am sleeping, but also provide enough covered area so I can cook aqnd eat. I lie being able to camp between shelters as the shelters are not always spaced a convenient distance apart, but lately every time I do I end up skipping breakfast because I am not willing to squat in the rain and cook. If you want a laugh, go online and check the extended forecast for Pearisburg, VA. I have been wet for three days now, and it looks like there is no end in sight. I dream of being dry. I should be in Pearisburg on Wednesday. I have a lot of mail waiting for me there, and I plan to take a day off. I'll go to the laundry and get everything clean and dry. Simple pleasures. So Ken, I was a manly man last night and slept out in the rain instead of going to the motel. What have you been up to? It rained again last night. It was still raining when I got up at 6:30. Well, it's not the end of the world. I guess I'm getting used to being damp. I can't even pretend anything I own is actually dry anymore, there are just varying degrees of wet. But all was not lost. I caught some good radio last night. The local NPR station plays Swing music from 8:00 - 9:00, then some really good jazz from 9:00 to 11:00. But back to this morning. I got up and pulled on my rain jacket, then walked out and got my wet food bag down out of the tree where it hung overnight. I cooked breakfast in the rain, packed up my gear, and started hiking. I made an executive decision and decided that I am going to get to Pearisburg tomorrow rather than on Wednesday. In order to pull that off I need to walk about 40 miles in two days, so I walked 24 miles today and will attempt the other 16.5 tomorrow. I've never hiked 24 miles before, and my feet are complaining big time. I've also raised a blister on the little toe of my left foot. I hope I didn't sabotage myself and make myself incapable of hiking the miles tomorrow. I am really looking forward to being clean and dry and sleeping in a bed that isn't damp and smelly. I am camped tonight at a nice little shelter with three section hikers. Section hikers tend to have amuch wider repertoire of conversation than thru-hikers do, who tend to talk about food whenever they aren't telling fart jokes, so I am enjoying the evening immensely. We've got a fire going and there is a real chill in the air tonight so that is very welcome. Four more thrus just showed up, so the evening promises to get even more interesting. I think this is going to be an ibuprofen night, only the second of the hike. It should help ease the ache of my feet and hopefully they will heal up a lot overnight. Sorry, I know this has been a bit incoherent. I am really tired tonight and finding it hard to organize my thoughts. You'll hear more from me once I get settled in Pearisburg, hopefully tomorrow night. I am planning to take a zero day (or maybe even two) there. I should have a bunch of maikl waiting at the post office, and will be switching out all my cold weather gear for the summer gear Jodi has sent to me. on towards my goal of Pearisburg. pretty much capped the day for me. my enthusiasm for the trail. while I am here. I am going to take at least one zero day here. have to take an extra day off before I get back out on the trail. Without healthy feet this hike would be impossible. I took a zero day in Pearisburg today. My left foot is really a mess. of alternating two pair of soggy socks in my boots! same, I was awake at 6:30.
and before I knew it, it was too late. and activity schedule. I also posted my latest photos to my website. WHS box from this computer. that work done that I mentioned before. have to share with a couple dozen other people. myself to 16 - 18 miles per day. strike, so it's here that I am staying for yet another night. here to the Hiker Hostel at Holy Family Church. the street from the motel. in my backpack it feels like I am hauling a barrel of bricks. walking on the road that makes it feel like torture. extra possessions, I'll head back out onto the trail. right now I am looking forward to getting back on the trail. The little group of people I was camping with most nights are all several days ahead of me now, so I will be socializing with a new group of hikers now. It's a bit sad to lose contact with people I've been hiking with for several weeks, but it's also good to be meeting other people. It's all part of the trail experience.